A Glasgow-based butcher’s shop has scooped two top industry accolades at the prestigious Butcher’s Shop of the Year 2016 Awards, run by Meat Trades Journal. Shop manager, John Mackie and Stewart Collins of S Collins and Son, with the awards they won at the recent Butcher`s Shop of the Year 2016 Awards. 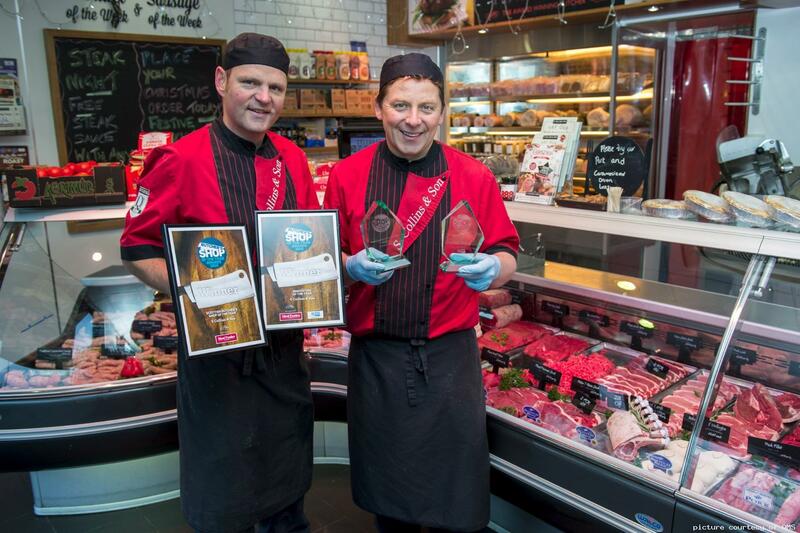 S Collins & Son won the title of “Scottish Butcher’s Shop of the Year” at the annual event held this month, as well as being recognised for its innovation efforts following the release of its new customer app. The annual Butcher’s Shop of the Year Awards reward excellence and innovation in butchery, farm shops, food halls and online retailers across the UK. S Collins & Son, based at Lindsaybeg Road, Muirhead, employs 26 staff and is run by brothers Stewart and Fraser Collins, the third generation of the family to run the business which was established in 1955. The business is a member of the Scotch Butchers Club, run by Quality Meat Scotland (QMS), which has butcher members throughout the UK. Members of the club are committed to sourcing and clearly identifying top quality Scotch Beef PGI, Scotch Lamb PGI and Specially Selected Pork from approved suppliers. The business offers over 600 products and sources Scotch Beef and Scotch Lamb from Lanark auction market. The family-run business is very highly regarded in the local community and, among its innovative initiatives, it offers a blue light discount for members of the emergency services and armed forces as well as its very own “Gold Card” loyalty programme. Stewart Collins, joint-owner of award-winning S Collins & Son, commented: “This year’s awards mean so much to us and I am incredibly proud of our staff for all their hard work. “With a strong team driving the business, we welcome input from those old and new, and particularly appreciate the dedication of our long-standing employees, namely John Mackie, who has worked in the shop for over 30 years. 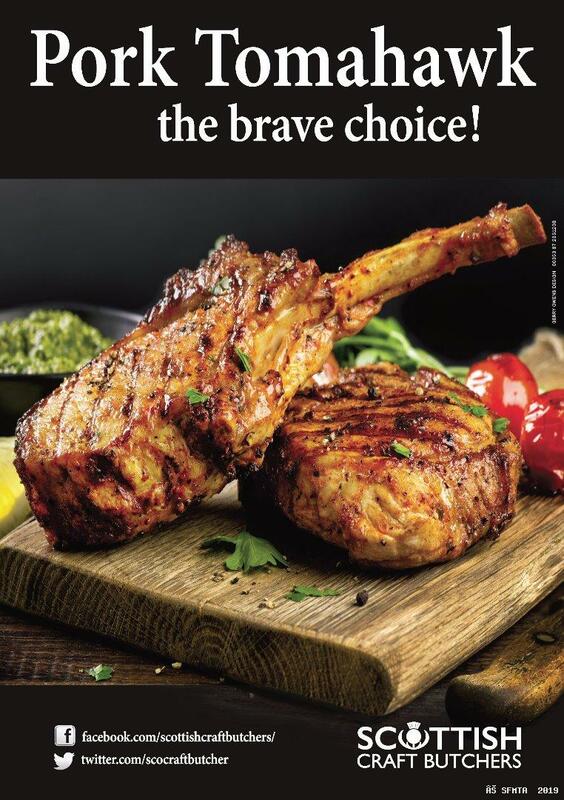 “We are always working to develop the business, and this year’s accomplishments included the launch of our app which allows customers to keep up-to-date with what’s happening in-store, quickly look up delicious Scotch Beef and Scotch Lamb recipes and browse our extensive gourmet range. Graeme Sharp, Marketing Executive at QMS, said: “S Collins & Son are at the top of their trade and very deserving of their successes in this year’s award. The S Collins & Son app is available to download from iTunes and the Google Play store. Other finalists in the ‘Scottish Butchers Shop of the Year Award’ included Forbes Raeburn the Family butcher, based in Huntly, Aberdeenshire.